Powerful administration software providing schools with the tools they need to operate smoothly & efficiently. School Bytes is a comprehensive school management platform providing schools with the tools they need to operate smoothly & efficiently. Created using first hand experience from within the education sector, School Bytes focuses on the needs and requirements of Australian schools. Simply use your existing NSW DoE portal login for easy access to the School Bytes platform. School Bytes makes use of established data transfer protocols such as 3PI (SIF) and LISS to create a unified experience for users. We use modern encryption methods to store personal information so you can be confident that your school information is safe. With the School Bytes payments module, schools can easily generate and email statements of account to parents, provide a direct link to online payment (POP) and send reminders. 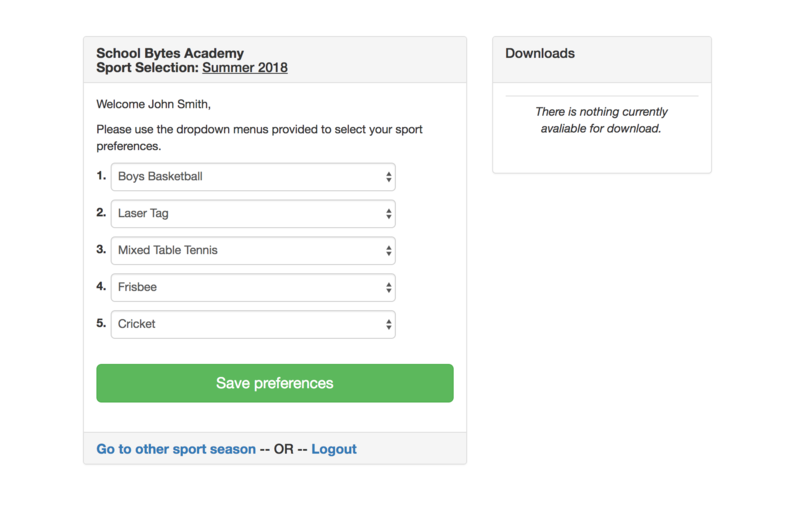 School Bytes' sport selection system allows students to select their sport choices online and provide sport organisers with management of rolls in a clear, easy-to-use format. The School Bytes variation of routine (VOR) module provides seamless management of VORs within a digital ecosystem, from the initial outline by the creating teacher, to approval by administrative staff, and roll marking by supervising teachers. Please contact us to request a quote to get started using School Bytes at your school. School Bytes is an approved supplier under the SCM0020 Prequalification Scheme: ICT Services (Base & Advanced) for the NSW Government. At age 17, Blake Garrett founded School Bytes whilst studying for his HSC at Chatswood High School in 2015. Blake continues to lead the company through managing technical development and overseeing strategic direction. With a keen interest in business, focusing his efforts towards learning about economics, finance and the way businesses are run, Adrian Monsif brings a wealth of experience and knowledge to School Bytes. Dane Luo graduated from high school in 2016 as School Captain. Since 2015, he has run an annual Mock Parliament Competition, held at NSW Parliament House. Dane brings first-hand experience in providing direct assistance to schools. Listed below are some commonly asked questions about the School Bytes platform. How do we obtain school student data? Upon joining the School Bytes platform, the school Principal (or his/her delegate) authorises School Bytes to have access to the relevant student and staff data required. That data is then securely transferred to the School Bytes cloud infrastructure through the NSW Department of Education's Third Party Integration (3PI) framework. Where is student data stored? Student data is stored on-shore in Australia within the Amazon Web Services (AWS) Sydney (ap-southeast-2) data centre region. How do we maintain the integrity and security of your data? All access to the School Bytes platform occurs over HTTPS/TLS to prevent unauthorised access to data, coupled with AES-256 bit encryption within the School Bytes database at rest and in transit. Sensitive data can only be accessed by authorised representatives at a school as determined by the principal. What is the pricing model for School Bytes? School Bytes is billed to a school on a per-student, per-module, per-annum (p.a) cost plus GST. This cost is inclusive of ongoing support, training and maintenance where required. "Blake Garrett has provided outstanding service to this school. He has tailored software to suit our needs and responds immediately to any difficulties we may be facing. I highly recommend him and the School Bytes software." "School Bytes has provided a user-friendly, DoE-compliant, time-saving, parent-friendly package. I would highly endorse it to any school and would recommend it as an integral part in meeting the needs of their school community." "The number of adminstration hours saved by not having to print, fold and mail these statements every term has well and truly paid for our investment in this program. Not only that, reprinting and looking up statements is far quicker and easier than via ebs4." "School Bytes is amazing! It integrates seamlessly with the LMBR systems. You can track and collect student fees at the click of a button. School Bytes has saved our administration staff countless hours." Thank you for visting the School Bytes website. If you have any questions about our platform, please use the form below to get in touch. Copyright © 2019 School Bytes Learning Pty. Ltd. All rights reserved.